The story behind $50SAT, a new approach to amateur satellite design which became the world’s smallest operational satellite, built for £125 in a garden shed. On Saturday, August 6, Stuart Robinson GW7HPW gave a presentation on the amateur radio satellite $50SAT to the Electromagnetic Field event EMF 2016 in Guildford. Talk Description: If you are building an Amateur satellite the simple choice would be to assemble a device with all the latest satisfyingly advanced and complex tech. The $50SAT team made a decision to go against convention and produce a design with the minimum of components. $50SAT was the first of a new class of satellite pioneered by Professor Bob Twiggs KE6QMD; the PocketQubes, designed to be small and light so they would be cheap to launch. $50SAT was launched in November 2013 using a Dnepr rocket from Dombarovsky Air Base in Russia and remained working in orbit for 20 months, the team had only expected it to last for a month at best. The ITU World Radiocommunication Conference 2015 (WRC-15) is taking place in Geneva from November 2-27. On Tuesday, November 3 at 1241 UT there was an amateur radio link-up between WRC-15 and two astronauts on the International Space Station (ISS). The contact took place using the permanent amateur radio station at the ITU. The station’s normal call sign is 4U1ITU but during the conference the special call sign 4U1WRC is being used. Students from Institut Florimont were able to use the ITU station to talk to astronauts Kjell Lindgren KO5MOS and Kimiya Yui KG5BPH who were using the amateur radio station in the ISS Columbus module, call sign OR4ISS. The Amateur Radio on the International Space Station (ARISS) program established the first permanent amateur radio presence in space 15 years ago. The inaugural ARISS contact took place on December 21, 2000, between a member of the ISS Expedition 1 crew and youngsters at Luther Burbank Elementary School near Chicago. Several pupils and a teacher got to chat using amateur radio with “Space Station Alpha” Commander William “Shep” Shepherd KD5GSL. The ARISS program lets students worldwide experience the excitement of talking directly with crew members of the International Space Station, inspiring them to pursue interests in careers in science, technology, engineering and math, and engaging them with radio science technology through amateur radio. The $50SAT amateur radio spacecraft ,which measures just 5x5x7.5 cm and weighs only 210 grams, has ceased transmitting after nearly 20 months in space. 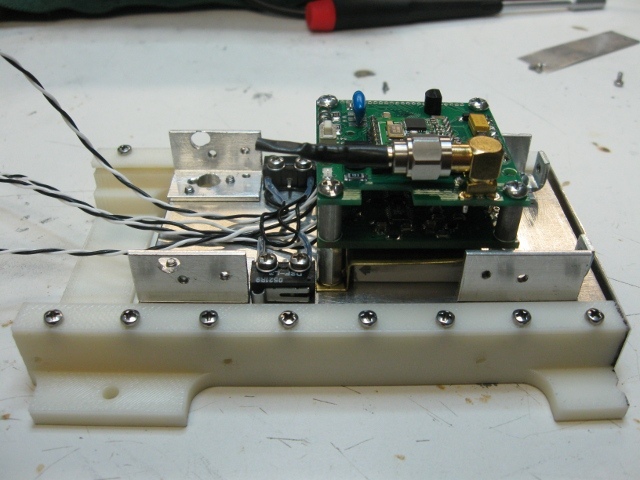 Michael Kirkhart KD8QBA provides an update on the $50SAT amateur radio spacecraft which measures just 5x5x7.5 cm. Sunday, June 21, 2015 marked the 19 month anniversary of the launch of $50SAT/MO-76/Eagle-2. The good news is it still operating. The bad news is the power situation has been degrading, with an apparent step change on or near May 12, 2015, followed by another on Tuesday, June 23, 2015. The last full telemetry capture made here in EN82 land was on Wednesday, May 27, 2015, and the last time it was heard was on Friday, June 6, 2015. I continued to attempt to listen for it for another week or so, and heard nothing. Has anybody heard it since then? At this point, I have been monitoring it using Anton’s (ZR6AIC) WebSDR as it makes daytime passes over South Africa. These occur between 7:30 and 9:00 UTC, which translates to 3:30 and 5:00 AM here in EN82 land. This is tough, as I am not a morning person. Sometimes, however, you have to do these things; helping build a satellite might be a once-in-a-lifetime event. During these passes, where it has already spent a significant amount of time in sunlight, the battery voltage is below 3400 mV. Is the battery going bad? While it is certainly possible the battery has suffered from some loss of charge capacity, one has to remember it is does not generate energy; it merely stores it. Since it is the solar power system that generates the power used by the satellite and stored in the battery, could the drop in battery voltage be due to a degradation in solar power generation? Notice how the MPPT current trend line has been sloping downward, similar to that of the battery voltage. Moreover, starting 2 weeks before June 4, 2015 (each X axis division on the chart represents 2 weeks time), each reading has been at or below the trend line. * Solar cell damage due to sputtering: since there was no protective covering on the solar cells, impacts from high energy particles can damage the cells, causing a drop in output. * Solar cell damage due to thermal cycling: We know from telemetry data the interior of the satellite cycle between +30 degrees C and -30 degrees C each orbit. It is likely the exterior temperatures experienced higher extremes, and this periodic thermal cycling may have caused the solar cells to fracture, thus leading to a drop in output. * Short circuit failure of one or more of the diodes which isolate each MPP tracker output, which can cause an inactive MPP tracker (one whose corresponding solar panel is not facing the sun) to load an active one (one whose corresponding solar panel is facing the sun). Because of the limited amount of telemetry gathered, it may not be possible to determine the exact cause. If the solar output power continues to drop, the battery voltage may never get above the 3300 mV threshold needed to enable the transmitter, at which point we will lose the ability to monitor its status. Even if this does happen, however, we never really thought it would last this long. We would have been happy if it just worked, and really happy if it lasted a month or two. 19 months – this is way beyond what any of us expected! As of June 25, 2015, the orbit has decayed by about 73 km since launch. Since April 21, 2015, it has been decaying at a rate of about 1 km per week. Apogee is now at 561 km, and perigee is at 529 km. As always, please post any telemetry, or for that matter, any reception reports to the Yahoo discussion group. We would especially like to encourage our friends in the southern hemisphere to listen for $50SAT/MO-76/Eagle-2. We really appreciate everyone who has provided reception reports and telemetry as well as access to their WebSDRs. To date, we have 3,098 individual error-free telemetry captures, and the vast majority of these did not come from Stuart, Howie, or I.
Saturday, February 21, 2015 marked the 15 month anniversary of the launch of $50SAT/MO-76, and you guessed it – it is still operating. Thursday, February 12, 2015 marked a different milestone – its orbit has decayed to the point where its mean motion crossed the 15 orbits per day threshold. The TLEs from Saturday, February 21, 2015 indicate it is now at 15.00521293 orbits per day. Some of you noticed that something odd started happening on Monday, February 23, and Tuesday, February 24. We also noticed the same thing – during daytime passes in the northern hemisphere, $50SAT was transmitting once per minute, always sending telemetry in RTTY format, but never sending GFSK telemetry packets. Moreover, the total reset count kept going up by one each time. What seems to be happening on the decending (daytime) passes is the CPU is reset just after sending a full RTTY telemetry message, as here are no GFSK packets sent, but within a half minute the FM Morse beacon is heard with Stuart’s callsign (GW7HPW, the first one in the rotation). My guess is the battery voltage is decaying during the operational cycle, and goes below the 2.9V reset threshold just after sending the RTTY or just as it is about to send the GFSK packets. Once the satellite is able to enable solar power (PCB temperature >= 0 degrees C), it starts behaving normally; it is now able to send GFSK packets. During ascending (nighttime) passes, it behaves normally, at least here in EN82 land. There was a brief time where this behavior stopped (2015-02-25, 17:05 UTC through 2015-02-26, 3:47 UTC). It did, however, start back up sometime before 2015-02-26, 05:21 UTC, and has continued since. Why is this happening now? We are still investigating, but it is apparent when looking at the chart of battery voltage over the lifetime of $50SAT/MO-76 that the battery has suffered a sizeable drop in capacity. If the battery voltage under load is dropping below 2.9V, how is it able to recover back above 3.3 V (the minimum required to enable transmission) and nearly complete another operational cycle? Moreover, why does it always seem to be able to finish sending an entire RTTY packet before resetting? In the hopes of better understanding what is happening, I am in the process of re-assembling my “BoxSat” test setup in an effort to reproduce on the ground what is happening in space. In the meantime, the once-per-minute transmission is actually convenient from telemetry monitoring standpoint, as one no longer has to wait 3 minutes for $50SAT/MO-76 to start transmitting. So, for any of you who have not heard $50SAT/MO-76, now is the time. Who knows how long it will continue to operate in this manner? Who knows how long it will continue to operated at all? Every time an anomaly has occurred and thought, “this is it – well, it was great while it lasted”, $50SAT/MO-76 has proven me wrong. I hope that is the case here as well. During the recording, I switch back and forth between FM and LSB modes so I can hear the FM Morse beacon as well as the RTTY telemetry. 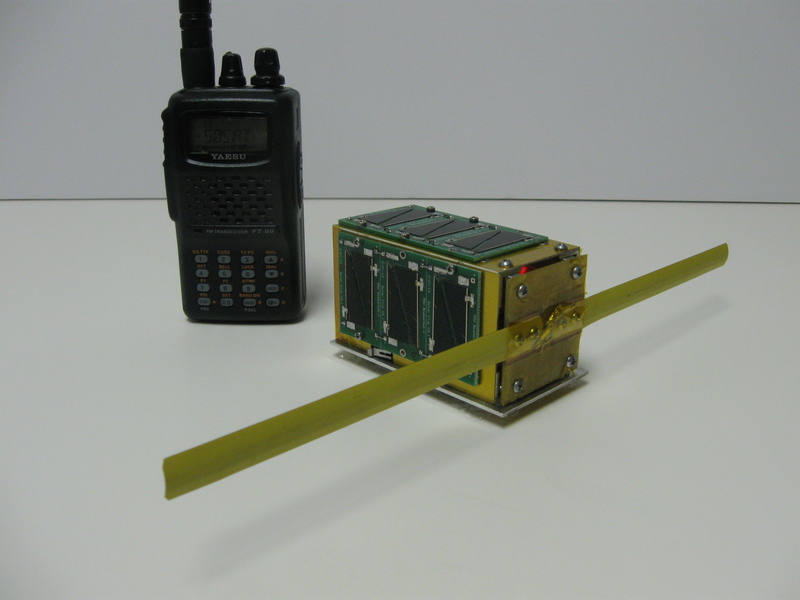 Friday, November 21, 2014 marked the one year anniversary of the launch of $50SAT/MO-76 PocketQube satellite. Our little creation was launched from Dombarovsky Air Base in Russia at 07:01 UT (which was 2:01 AM here in EN82 land) as one of 33 satellites aboard a Dnepr rocket. It was first heard by Jan, PE0SAT, at 08:46 UT, and by Stuart GW7HPW at 09:17 UT, and has been operating continuously ever since! The $50SAT/MO-76 Dropbox now contains a snapshot of all the telemetry gathered from launch day through November 21, 2014. $50SAT/MO-76 continues to operate normally, but the battery capacity has been slowly dropping to the point where it barely registers above 3500 mV when passing over EN82 land during daytime (decending) passes. I have been able to capture telemetry while it passes over Anton’s (ZR6AIC) WebSDR station http://zr6aic.giga.co.za:8902/ which is located in South Africa. During ascending passes, which occur between 20:00 and 21:30 UT, $50SAT/MO-76 has just transitioned from being in sunlight to being in eclipse, and the battery voltage is between 3602 and 3642 mV. While we did not have time to demonstrate this at the AMSAT-NA Space Symposium, we now have a working Arduino/RFM22 based groundstation. It utilizes a slightly modified version of the Sparkfun RFM22 Arduino shield https://www.sparkfun.com/products/11018 Additional information, including photos, marked up schematics, and the Arduino sketches, is available (guess where?) on the $50SAT/MO-76 Dropbox. In addition to the original, receive-only sketch (S50SAT_receiver), there is a new version (S50SAT-Groundstation) which includes transmit capability, which supports all three open uplink commands. Both versions are capable of receiving all GFSK based packets, including the FEC packets. I have successfully received $50SAT info and FEC packets from about 1200 km slant range with my groundstation using an Advanced Receiver Research P432VDG LNA http://advancedreceiver.com/page5.html with my homebrew 6 element WA5VJB yagi. The LNA is needed to improve the sensitivity of the RFM22, which is about -99 dBm. Since the RFM22 can only output 20 dBm (100 mW) and the minimum EIRP needed to uplink to $50SAT/MO-76 when it is directly overhead is about 36 dBm (4W), either a 16 dB gain antenna, an external linear amplifier, or both will be needed to successfully uplink. Speaking of uplinking, no one has completed the $50SAT/MO-76 Uplink Challenge. This challenge is open to any licensed amateur radio operator, and the prize for successful completion is (drum roll…) a certificate of technical achievement, signed by all three of the $50SAT/MO-76 developers. Our thanks to all who has supported us in this project, including all of you telemetry gathers. Please keep the telemetry coming!